This model is a typical example of a robotic arc welding cell that is installed in many industrial manufacturing establishments today. These fascinating machines, designed to work faster, longer and with improved accuracy over their human counterparts, can undertake many tasks, including welding, paint spraying, spot welding, component handling or can be used in hostile environments where the risk to human labour is not acceptable. The system shown here comprises of a 5 axes robot arm, an external axis manipulator to handle the welded component, a Mig/Mag welding set (power source) and a protective welding barrier screen to the rear. The robot is controlled by a Meccanisms Motorvator control unit, which has the ability to drive all the axes and handle the programming, which allows the machine to run an automatic welding cycle with measured repeatability. The robotâ€™s axes are all motorised with positioning feedback to allow the Motorvator controller to monitor where each axis is at any time. The axes are numbered in the usual robotic configuration, starting with the rotary base first which is known as the first axis, the shoulder joint is the second axis, the elbow joint is the third axis, the rotating forearm ia the fourth axis and the wrist is the fifth axis. The manipulator becomes the sixth axis. The welding power source is based on a Fronius 4000 model, which is an extremely accurate, precision welding device. The real unit can deliver a pulsed, sinergic welding arc which delivers a very fast chopped DC signal in the weld current circuit. This achieves superior weld penetration, smooth and neat weld seams and minimum welding spatter and oxidisation. The weld set has a top mounted wire feeder, which pays out the spooled welding wire to the welding torch. The gas bottle at the side of the welder contains a CO2/ Argon mixture, which helps to keep the arc pinpoint perfect and reduce porosity and spattering when directed around the arc corona. The manipulator axis in this case holds a girder section, which is being tack welded at regular intervals. Once tacked, the girder would then be seam welded. 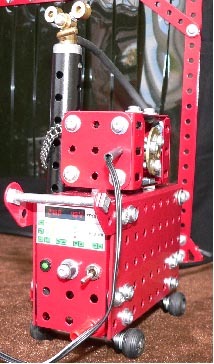 The manipulator is driven by a rotary servo actuator, which contains its own built in positioning sensor. This allows the manipulator to turn the work piece to any chosen angle over a full 360 degree rotation. The Motorvator is a programmable controller, which can operate four motors with controllable speed and direction. It will also command two radio type servo rotary actuators and switch up to three additional output devices. It is capable of monitoring six analog feedback circuits and four timed and four standard switches. The robot base is made from a heavy duty turntable, housing a ball bearing race which takes the weight of the whole machine. A precision Maxon gear moter provides the motive power to rotate the base. Positional feedback is achieved from a potentiometer, which is driven directly from the turntable gear ring. The base has full 360 degrees of freedom. The shoulder, or second axis sits directly onto the base. 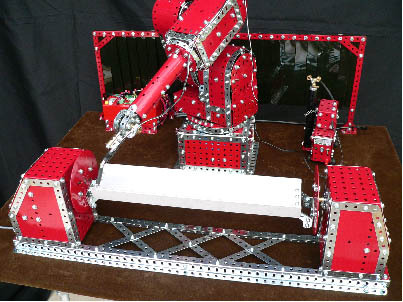 This axis is subjected to heavy forces when the robot arm is outstretched, and the gearing and motor drive had to be substantially increased to take the heavy loads that are required to move the arm. The design takes the working load of Meccano to its limits with the final stages of the gearing tripled up prevent the teeth from stripping. The elbow axis (Axis 3) pivots at the end of the shoulder arm section. 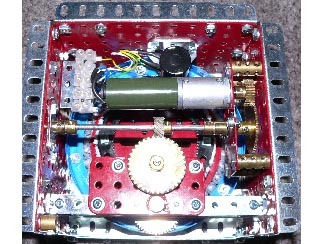 This is driven by a Meccanisms gearmotor with a 40:1 ratio built in gearbox. The motor, drive and feedback are all housed within the shoulder skeleton, with a second counterweight at the end to reduce load. This pivots on a custom made double bearing at the end of the shoulder skeleton as seen in the picture far right. The axis is able to rotate through a useful 300 degrees of freedom. The elbow frame is home to the forearm drive and also the wrist actuator . The forearm is moved by a miniature Maxon gearmotor. 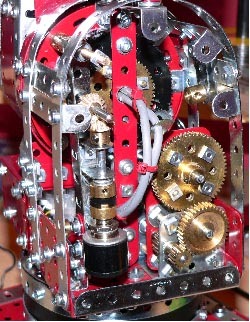 This turns a cage which houses the servo that moves the wrist axis. The forearm positioning is achieved by a potentiometer. The sevo for the wrist is similar to the manipulator and has its own positional circuitry built in. 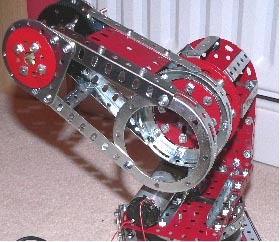 The Forearm drive and wrist servo cage. 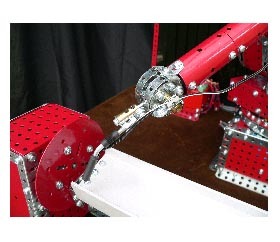 The final actuation of the robot arm is the 5th axis. The wrist is what moves the welding torch and is a fine positional axis. The wrist is moved by the servo in the forearm as previously mentioned. This is connected to the final movement by a long connecting rod which drives a pair of miniature bevel gears to give the wrist its in line rotation. The wrist has 180 degrees of useful movement. The wrist support arm holds a welding torch, which is powered by the welding power source. This is mated to the support arm by a flexible coupling, which allows the torch to bend safely in the event of a collision. The torch has a simulated welding arc provided by a ultra-violet LED, which is pulsed by an astable timing circuit built into the welding set.